We are a Quick, Economical Source for Standard or Custom Sized Envelopes Open-side Envelopes (from 3" x 4-1/4" to 10" x 15") and Open-end Catalog Envelopes (from 4-1/8" x 5-3/4" to 13-1/2" x 16-1/2"). Can ECS make open-end catalogs, large open-side booklet with special poly windows? Yes. We now have window patching for these larger envelopes. Please contact us today for an estimate! Can ECS make square envelopes and special sizes? Yes, ECS can create a wide variety of special sizes and square envelopes! If you don't see what you are looking for on our die list, please call for layout sheet size and price. Does ECS stock any ready made envelopes? ECS is a custom manufacturer. We do not stock any ready made envelopes. 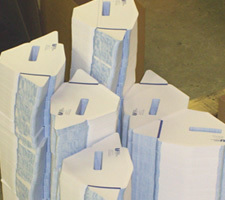 In five working days we can make your special order - blank envelopes, windows or regulars from our stock of plain 24 lb. white wove or blue inside tint stock. See envelope manufacture price section. What is "High Die" cutting? What is letterpress die cutting? Letterpress die cutting uses a thin steel rule die to cut and score one sheet at a time. This method is used for those designs with a critical register of bleeds with a minimum of wrap over the fold and those with minimum image shift of borders or other design elements. Letterpress work must be printed one-up on a larger sheet than for high die cutting because more gripper area is needed. Please see our letterpress sheet size guide and letterpress job checklist. How can I get a layout template? Digital files for most layout templates are available on our website. Be sure to check the sheet size guides for the type of die cutting you need. If you don't see what you are looking for, please call. We can also make square envelopes and custom sizes using the adjustable dies. Can ECS cut my stock to the correct size for die cutting? Yes. We will measure and cut your stock to the proper sheet for the best die cutting result. Cutting charge is $70.00 per hour with a half hour minimum. What weight of stock can I use? The caliper of the stock must be between .0045 and .0068 for standard sizes and between .005 and .0085 for open-end catalog and large open-side booklet sizes. Why is the grain direction of the stock important? Grain wrong stock curls up into the machinery causing jams, wasted stock and folding registration problems. What if my stock is "grain wrong?" We can change the settings on the machine and still run "grain wrong" stock. The set-up charge for "grain wrong" is $70.00 for standard sizes and $105.00 for for open-end catalogs and large open-side booklets. You should also provide an additional over run for set-up and waste. How much stock is needed for set-up and waste? An over run is required for set-up and waste in the converting process. The minimum for standard sizes is 300 or 10%; whichever is greater of the finished envelope count. For open-end catalogs and large open-side booklets, allow a minimum of 400 or 10%. Is full outside or inside ink coverage on the stock a problem? Full ink coverage requires NO ink or varnish in glue and gum areas. Adhesion is NOT GUARANTEED if ink or varnish is printed in those areas. Can the converting process mark the stock? What information should I send with my job? Provide a blue line or sample with your purchase order which should specify the ECS die number or exact size for special envelopes, the quantity, over run and samples needed, and shipping instructions. Use our convenient order forms! Our normal production time for most jobs is 3 to 5 days after the stock arrives here. Open-end catalogs and large open-side booklets can take 5 to 7 days. For RUSH ORDERS, please call in advance to schedule and for quotes on rush charges that may apply. What is Self-sealing Latex Gum? Self-sealing Latex Gum is a strong adhesive product that is applied in two strips. When the two strips are pressed together they stick to each other forming the seal. Can this product be applied over regular re-moisten seal gum on a ready-made envelope? Yes, latex gum can be applied over regular seal gum. 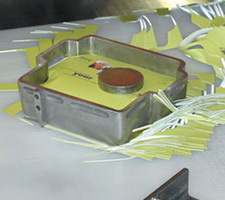 ECS can open the flaps of your ready-made envelopes for the latex application process. See the "Flaps Closed" section of the Latex price list. Is it a problem if there are different seal flap styles mixed in the order? The latex gum is applied with a stencil that is cut to match the seal flap and back of the envelope. If the flaps are different, the stencil must be changed. When converting flat stock, an additional over run is required for the latex application. An over run is also required when applying latex to ready-made envelopes. The minimum is 300 or 10%; whichever is greater of the finished envelope count. Are Self-sealing Latex Gum envelopes packaged differently than regular gum envelopes? Envelopes with Latex Gum are delivered with the flaps extended and are packaged in special size cartons. A Pre-mailer or Glue Bind Mailer is a form that has the edges of the sheet glued together to form a pocket. Usually it has a tear off return panel that is mailed back in the �envelope pocket� similar to a Two-way Mailer. Can ECS fold different types of "Pre-mailer" forms? ECS can fold 3, 4 or 5 panels into a glued pocket with 1 or 2 perfs and a re-moisten gum strip all parallel with the folds. The piece can be double parallel or roll folded. The minimum sheet width is 7" and the maximum sheet length is 22". If the sheet length is over 17 1/2", then it must be at least 8 1/2" wide. Should ECS cut my stock to the one-up sheet size? Because of critical panel sizes necessary for accurate folding, it is recommended that ECS trim your press sheet to one-up. Critical folding register of pre-trimmed stock cannot be guaranteed. $70.00 per hour cutting charge will apply. Is there a Grain Direction Requirement? The grain must run with the folds. GRAIN WRONG SET-UP is $70.00. An ADDITIONAL 5% maybe added to the run charge for Grain Wrong stock. The caliper of stock must be between .0045 and .0065. 10% ADDITIONAL IS ADDED to the run charge for MATTE or GLOSS COATED STOCK. An over run for set-up and waste is required. The minimum is 300 or 10%; whichever is greater of the finished count. My question isn't answered here. What do I do now? If you have other questions not answered here, please call or email us your questions.